Use the JGVP01 Vacuum Pump for engine, transmission, or gearbox sampling through the dipstick or access hole. Instructions: Remove the sample jar cap. Attach the tubing to the Vacuum Pump and insert the tubing into the oil reservoir through the dipstick tube or access hole. Actuate the pump until the oil sample comes up the tubing and fills the sample jar approximately 3/4 full. Throw away the tubing section after the sample is taken (never reuse the tubing section). Put the cap on the sample jar. Fill out the sample jar label completely and attach it to the sample jar. It's that simple!! Note: Always use a fresh tubing section for any oil sample. Use the JGVP02 Vacuum Pump for coolant sampling from the coolant reservoir. Instructions: Remove the sample jar cap. Attach the tubing to the Vacuum Pump and insert the tubing into the coolant reservoir. Actuate the pump until the coolant sample comes up the tubing and fills the sample jar approximately 3⁄4 full. Throw away the tubing section after the sample is taken (never reuse the tubing section). Put the cap on the sample jar. Fill out the sample jar label completely and attach it to the sample jar. It’s that simple !! JG Lubricant Services supplies used oil analysis kits to test different types of equipment and a host of different applications including engines, transmissions, differentials, generators, refrigeration equipment (reefer units) and APUs (Auxiliary Power Units). Our car oil analysis kit and other products are designed to meet your needs and provide both individuals and fleet managers with complete data that shows the overall health of both the oil and the host equipment. 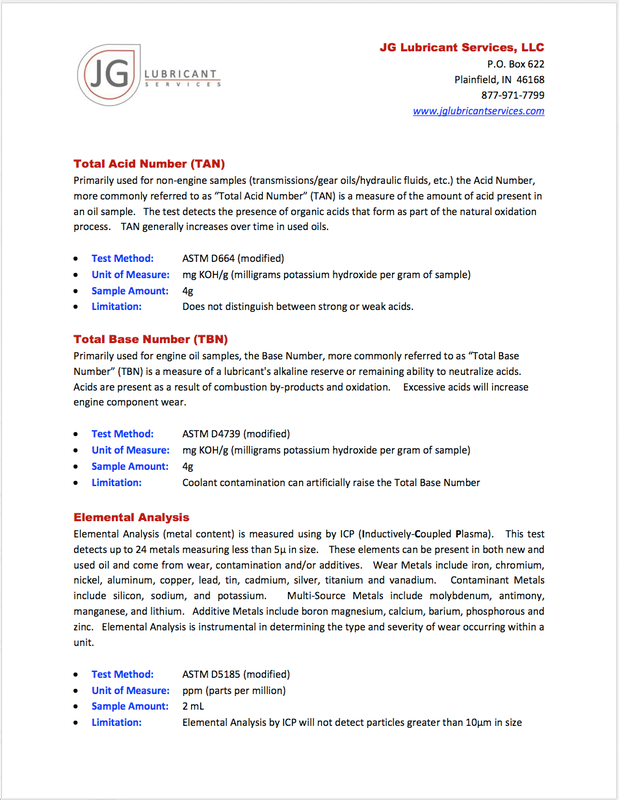 Our oil analysis kit is packaged in either single or 3-packs for individual sales through the online store. Oil analysis kits are also available in convenient 10-packs for fleet use and quantity discounts on all of our oil analysis kit types, are available from orders of 50 kits up to 1000 kit orders. 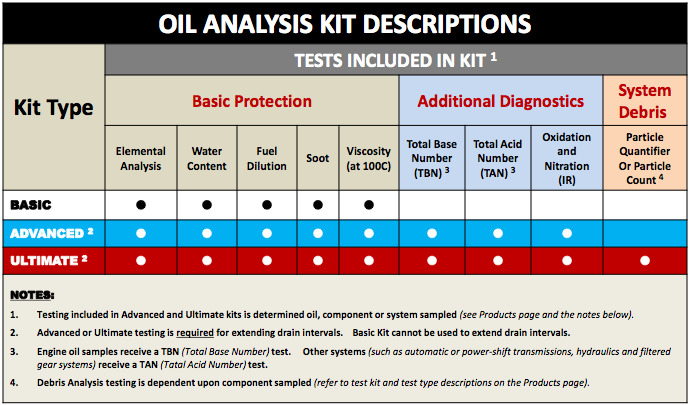 The JG Lubricant Services oil analysis kit is designed to meet all your equipment maintenance needs and ensures your equipment remains as “worry free” as possible. In an effort to meet all system demands, we have developed and currently market (3) levels of testing including our Basic oil analysis kit, an Advanced oil analysis kit and an Ultimate oil analysis kit. These used oil analysis kits can test engines, transmissions, differentials, generators, refrigeration equipment (reefer units) and APUs (Auxiliary Power Units). Our oil analysis service and lubricant analysis data gives you peace of mind in knowing your equipment is protected through scientifically proven testing and analysis methods. So, why not move from your current preventative maintenance program to a “predictive maintenance” program through JG Lubricant Services. Our car oil analysis kits and other products can get you where you need to be in order to maximize savings and maintain equipment in tip top condition. It’s the only way to ensure you don’t get caught fixing unanticipated problems that caught you “off guard” and that leave your equipment off the road and in the repair shop where it’s not ready for use and, in the case of a commercial vehicle, not making revenue.